Miami Trace senior Lindsey Worley watches the flight of her approach shot during an SCOL match against Clinton-Massie at the Club at Quail Run Wednesday, Aug. 31, 2016. 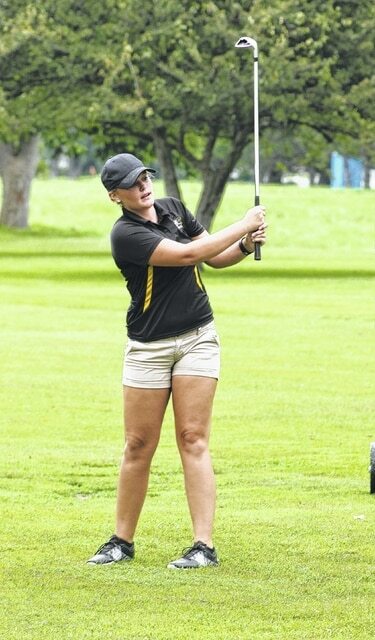 On a day that finally saw a break in the hot, humid weather, with rain showers moving through to help cool things down, the Miami Trace Lady Panther golf team hosted Clinton-Massie for an SCOL match Wednesday, Aug. 31, 2016 at the Club at Quail Run. Clinton-Massie won the match, 196 to 251. Tori Riley shot the low score of 59 for Miami Trace. Morgan Eggleton shot a 63, Makayla Eggleton had a 64, Lindsey Worley shot a 65, Shelbie Rowan recorded a score of 66 and Macey Stires shot a 72. Gabby Woods of Clinton-Massie was the medalist with a 42. Kelsey Smith shot a 48 for the Falcons. Other scores for Clinton-Massie: Angela Miller, 50; Taylor Kropp, 56; Emma Filipkowski, 60 and Jezreel Forand, 62. Miami Trace, now 2-3 on the season (all SCOL matches) will play at Wilmington Tuesday, Sept. 6 at 4 p.m.